Travel or travelling ante kondariki chiraku inka kondariki emo idi oka hobby, passion, and anthaku minchi. General ga manam two wheeler eskoni ameerpet nundi begumpet velle varaku chiraku vachestundi ofcourse adi traffic valle anukondi. 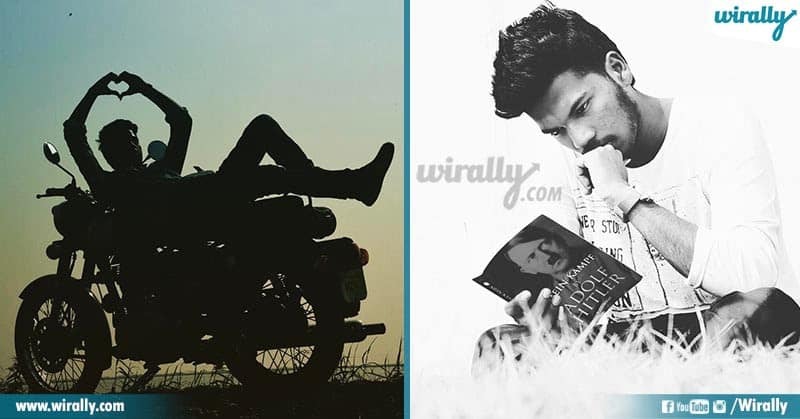 Kani bike mida okkade thousands of kilometres travel cheyali ante one should have strong desire, passion, and patience to do so. And recently travelling has not only become trend it has also helped a lot in changing peoples perspective towards life and people around them. Dani lo e mundi nenu kuda ma ayya dabulu karchu petti bike eskuni pota, apudu nenu kuda traveller a kda ani anukuna valu chala mandi unaaru kani dabbulu unte petrol kotinchkovachi kani bike eskuni pakisthan border ki veldam joke kaadu bhaiyaa. 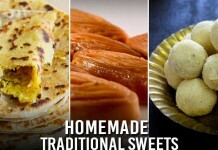 We have listed few travelers who are from Hyderabad. 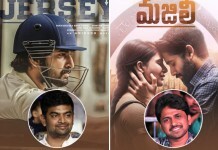 He is from Hyderabad , this story started last December andari la ne friends andaru kalisi oka trip kanyakumari too kargil plan cheskunnaru, but a planning white board meeda oka peru la migilipoindi, but pranay had a bigger dream behind the journey , pranay was hell bent to do this inka evari sahayam ledu anapudu he didn’t stop, okade he started his journey from kanyakumari to kargil a journey of 8600km many people asked him why was he doing it? was it to gain traction on social media ? 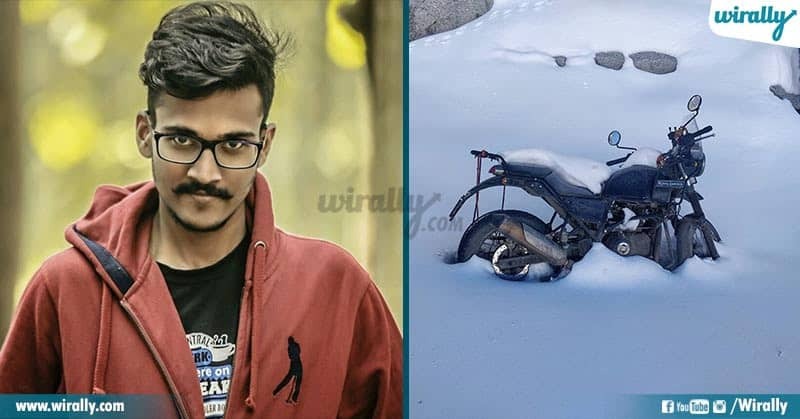 pranay said I am doing this because I want to create a pool of 1500 students across the country, urike traction kosam time pass kosam chesevadini aithe save cheskunna dabulu toh Europe trip veddunu, he quoted “there is so much potent across the country in different colleges I just want to tap them and give them opportunity” . Satya has explored almost 14 states in short span of time. 21 years old Satya is basically from Vijayawada. 2014 lo tana journey ni start chesina Satya India lo almost 14 states explore chesadu. Travel cheyadam different places ni explore cheyadam Satya profession la petkunadu. And tana sole motive and aim is to ‘’make a possible impact on the society that i’m living in and to improve the value of tourism and protect it by making people understand more about the places that they re living around so that they could protect the greatest monuments that are available’’ ani antadu. One man, One bike, 31 Days, 7000 Kms. And recent ga Tamilnadu state ni explore cheyalani anukuni 3rd June 2018 na journey start chesadu. With in a month (July 4 ) lo Satya Tamilnadu lo unna different places visit chesadu, almost 7000 kms travel chesadu. ATanu explore chesina different place ni mottham tana camera lo beautiful way lo capture chesadu. Tani tise prati pic chuse variki andulo life, point ofview, beauty convey aiyye la tiyadam Satya’s passion. last time i checked I have never met a person who has such good clarity on life. When I called him for a interview , ala matladtundaga I asked him bro why do you travel ? his answer made me smile. Interview ante andaru chala poetic feel toh answers prepare avtaru. But this guy simply told me on my face ki bhaiyaa naaku poetic ga chepadam raadu , nenu enduku travel chestanu ante naaku manushulu toh matladadam vala perspective telusukodam chala istam and I like to stop by in random places where nature surprises me. Manam evariki ichina promise aiyna marchipovachu kani nature ki ichina promise marchipo kudadu he said last time when I was in spiti I promised the mountains that I will be coming back on my bike next year, so that’s it here I am I travelled from Hyderabad to kargil just to fulfill my promise. Raghav believes for travelling all you need is a tent , rug sack and lots and lots of passion. 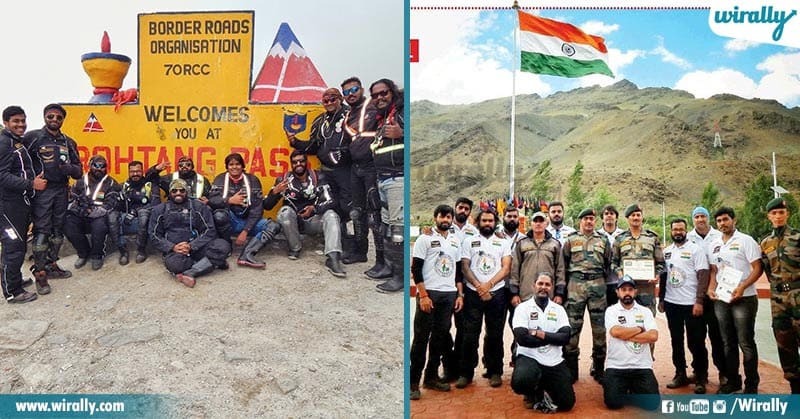 they are group of 12 hyderabadi bikers who set off for kargil on bikes from Hyderabad. 12 members 12 bikes 20days, shahasam ane cheppali, okade velina problem ledu because you know that you can take care of yourself kani what if you have to take responsibility of your fellow mate too ? okasari ga balls freeze aiyyayi kda . well this was a thanks giving gesture for wanderers as they wanted to be there on kargil vijay diwas celebrating it with soldiers who selflessly safe guard us. 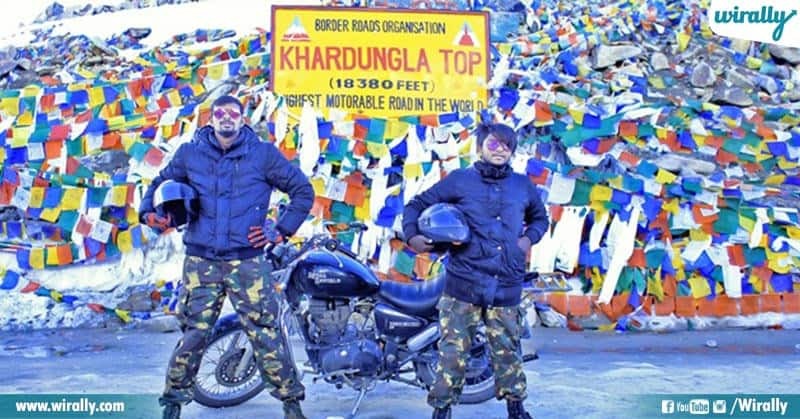 Suman Kannaiahgari and Sai Krishna went on a trip of a lifetime; they travelled from Hyderabad to Kashmir and then to Kanyakumari and back on a bike. And sai Krishna (21) freshly graduated as civil engineer. 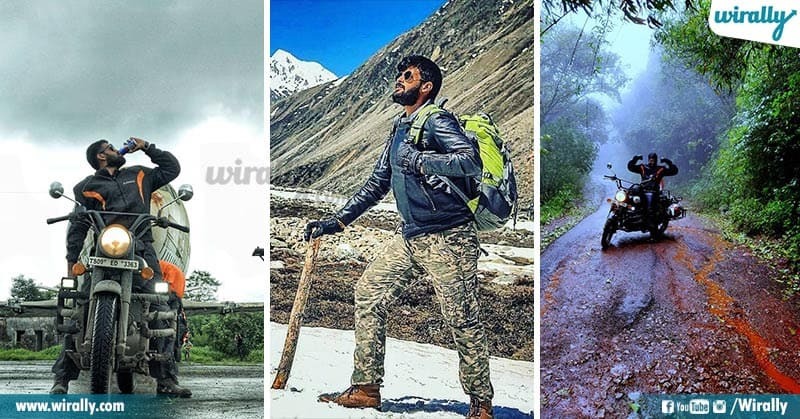 Oka bandi 50kg weight unna luggage and oka bike iddaru manushulu, prapapncham lo atti ettu aina prantham, khardungla, enduku e picchi enti indulo anandam ani evaro veelu iddarini adigite , they said” this is true adventure in life if you have not experienced it you haven’t lived your life. Next year they are planning to do it in cycle anta.. So these are few people we found out by spending hours and hours on google. Hope its worth it. if you know someone who has did something applaudable like these guys mention it in the comment. And also like share and comment .